Contemporary and Stylish Industrial Dressing Tables: The superior designing of the industrial dressing tables on display here make them fashionable, exciting, decorative and full of features. The furniture only uses recycled wood and metal including solid hardwoods like Pine and Oak to offer best-in-class reliability and utmost satisfaction. The environment-friendly dressing tables are only sourced from the best, most known and reputed furniture brands from across the world. 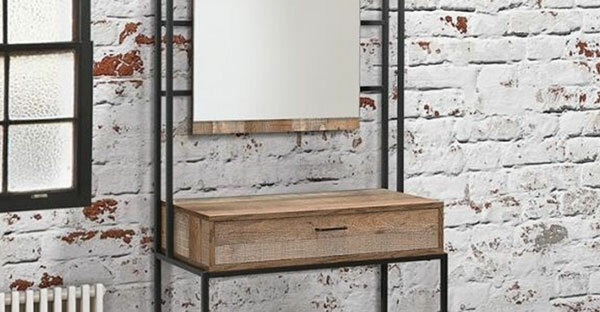 The Baumhaus Urban Chic Dressing Table has a unique and contemporary design and also functions as your laptop and computer desk. The wood used in furniture is more than 100 years old. The hand finished dressing table has a unique blend of reclaimed timbers, and the steel frame provided to it greatest structural rigidity. The 2 wide-spaced drawers have wide size and are glide-ons so that you have an effortless operation. The hardwearing resilient satin lacquer emphasises on the character and beautiful colour of solid hardwood. The dressing tables here can easily last a lifetime and more with a minimum of care. We also continuously add new products, so that you have the best of choices and can benefit from our hand-picked collection.